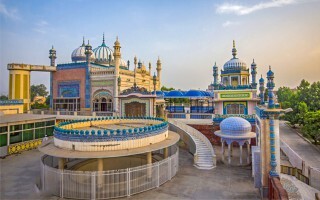 Bhong Mosque is located in the village of Bhong, Sadiqabad Tehsil, Rahim Yar Khan District, Southern Punjab Pakistan. 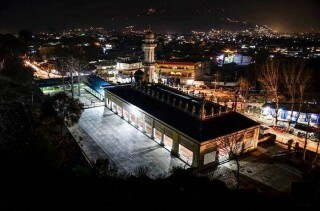 It was designed and constructed over a period of nearly 50 years and won the Aga Khan Award for Architecture in 1986. 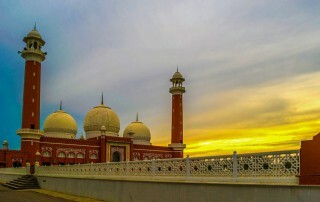 The mosque is located at the distance of 200 kilometers from Bahawalpur and 50 kilometers from Rahim Yar Khan and is well known for its exquisite design and architectural beauty with gold leaves carved for the intricate decorative patterns and the stylish calligraphic work. 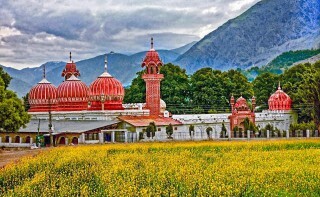 Sardar Rais Ghazi Mohammad Indhar, a wealthy landlord, commissioned this mosque in 1932 to be the jewel of his new palace compound, which already included a mosque and a prestigious Madrasa (religious school) and was completed in 1982.